Veterans are highly skilled, hard working and collaborative. How can they flourish in your company? Patrick Doran spent eight years as a security specialist with the U.S. Marine Corps, but he might be the last person to tell you so. And it has nothing—and everything—to do with pride. Your motivation for hiring veterans may not always adhere to their motivation behind the job search. Veterans entering the workforce may experience a loss of camaraderie, mission focus and clear opportunities for job advancement. Those who haven’t served in the military often find there are lessons to be learned when hiring veterans. Come face-to-face with a veteran, and a mere “Thank you for your service” doesn’t seem to cut it. There’s often a desire to do more, to offer special treatment or a leg up. But in doing so, even the most well intentioned gesture can cause an unintended result. Take job placement, for example. Companies may want to hire veterans because they believe it’s the right thing to do, but that’s not necessarily what will attract vets—or encourage them to stay. This combat plan, however, requires more than just changing your mindset. It’s the creation of not just a job but also a welcoming and supportive environment, one that is built around celebrating and fostering veterans’ inherent skills and understanding the true challenges they face when transitioning to civilian life. Speak to anyone about hiring veterans, and the reactions can be split. Some will advocate for giving back to those who have sacrificed so much. Others might worry about potentially violent or reactive behavior resulting from post-traumatic stress disorder or, if the veteran went into the service young, a lack of maturity and life skills. But there’s another part of the equation: a basic lack of understanding about the transition from military to civilian culture. Those who haven’t served often find there are lessons to be learned. Jim Pender would be quick to agree. Back in 2012, Pender co-founded Disabled Veterans Insurance Careers (DVIC). The idea was to educate, train and secure meaningful employment for physically disabled veterans. These veterans would cross-sell personal lines insurance products on behalf of independent agencies, with a goal of making 80 calls and landing at least two appointments each day. “Our initial assumption was that veterans would be ideally suited for the insurance business because they are mission driven and tech savvy,” Pender says. Veterans were accustomed to giving and taking orders, he and co-founder Gary Trippe reasoned, and used to working on teams. Pender didn’t have military experience himself, but both he and Trippe had disabled family members, as well as a sincere desire to help. At the time, the men were principals with Florida-based independent insurance agency BB&T-Oswald Trippe and Co., and they wanted to share the success and sense of purpose they’d found in insurance with returning veterans. Other industry leaders joined the effort, with support from Marsh and McLennan Companies, Bankers Insurance, Chubb, Knapp Consultants, The Council, Liberty Mutual, United Way, and a host of others. Those who work with veterans have found, for example, that there can be a loss of camaraderie post-service. There also can be a loss of mission focus, structure, oversight and clear opportunities for job advancement. Veterans might use different speech than their co-workers, defaulting to military terms and acronyms unrecognizable to civilians. They might find themselves overwhelmed by the number of decisions they now must make on their own and have difficulty finding basic services, such as healthcare, once provided by the military. They might have trouble relating to others who have not experienced the level of stress that service brings. They might encounter a competitive workplace that’s at odds with the more collaborative environment they knew in the military. And they might face cultural gaps that developed while they were deployed. Shad Steadman, past chairman of The Council and current vice chairman of MMA-Mid Atlantic at Rutherfoord, said he was happy to be involved with DVIC as a strategic board member; the overall effort was enthusiastically received, he says, “almost to a person.” In retrospect, however, the focus might have been too narrow. Not everyone—military background or not—has an interest in or an aptitude for the type of sales that particular job required. The experience did, however, generate a lot of “interesting conversations around things veterans might need,” Steadman says. There’s always the possibility that strategic meetings in the future could explore different ways of bringing the insurance industry and veterans together in a more holistic, helpful way. All told, DVIC, which has since closed its doors, helped place 18 veterans in insurance careers. One of those 18 was Doran, who discovered a love and appreciation for an industry he might not otherwise have considered. Somebody needs to make a business case, and not just start a feel-good effort. “It’s the best job I’ve ever had,” he says. It doesn’t hurt that his supervisor is also a veteran. Within the first three years, Hiring Our Heroes held nearly 800 hiring events, working with a broad coalition of public and private partners, with tremendous results. Today, veteran unemployment is below 4%. But different challenges have emerged. 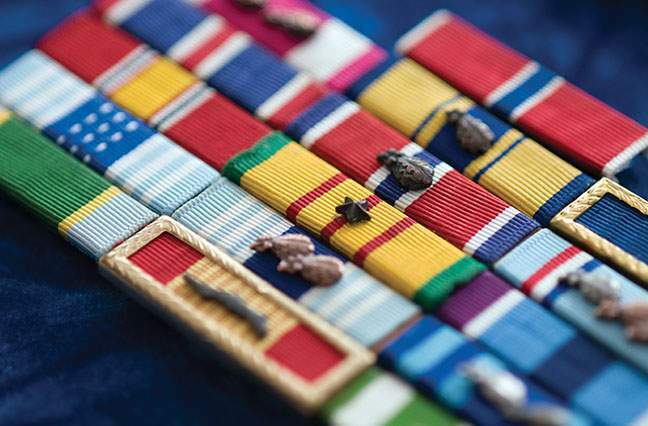 In recent years, studies have shown that half of veterans leave their first civilian job after service within 12 months—typically looking for new challenges, more money or a better offer. To help combat these issues, Hiring Our Heroes is putting more of an emphasis on finding veterans the right job—rather than just any job to make ends meet. Hiring Our Heroes now holds hiring events on military bases, helping service members plan ahead up to a year before leaving the service. There’s also greater outreach to military spouses, who still face an unemployment rate of 16%. A report on this topic by Hiring Our Heroes, released in June 2017, found that, while less than 20% of employed spouses have seasonal or temporary jobs, 82% would prefer something permanent. According to the study, one in four employed spouses is working multiple jobs and roughly 70% don’t believe their education or past work experience is being fully utilized in their current job. Respondents said companies don’t want to hire active-duty military spouses because of the likelihood they’ll move. The spouses often can’t find flexible work schedules or affordable childcare, the study found, and they may have challenges explaining time gaps on their résumés. In addition, these spouses may be unable to transfer professional licenses; they may have fewer connections and social networks than others; and they may be unable to find meaningful jobs near military bases. Some in insurance have been able to do just that. Marsh and McLennan has so strengthened its efforts to reach veterans and their families that it has become a key influencer in the veteran talent space at the national level. In 2017, the global professional services firm was named the No. 1 Military Friendly Employer in the U.S. by Victory Media; for 2018, it remained among the top three, along with IBM and Boeing. James Tongate, program manager of Military and Veterans Affairs at Marsh and McLennan—he’s also a combat veteran and chief master sergeant with the Kentucky Air National Guard—says success has come through a holistic approach using the entire employment lifecycle. That encompasses acquisition, onboarding, engagement, development and redeployment. There’s an appreciation that veterans bring skills in areas like team building and resiliency, he says, “and our company is poised to leverage that talent and ease their transition.” Tongate contends it’s never enough just to check a box by hiring veterans—companies must do the necessary work to keep them fully engaged. Helping veterans want to stay in their jobs, then, requires an effort to understand their mindset. Organizations like Marsh and McLennan and UPS make it happen by fostering a welcoming culture among non-veteran employees. Our initial assumption was that veterans would be ideally suited for the insurance business because they are mission driven and tech savvy. There were things about the transition from military to civilian life that we just didn’t understand. In 2013, in conjunction with the Obama administration’s “Joining Forces” initiative, UPS made a commitment to hire 50,000 veterans and log 50,000 volunteer hours within the following five years. The company met its hiring goal two years early and has now surpassed more than 250,000 volunteer hours. Veterans account for nearly 7% of the UPS workforce, about the same percentage of veterans as in the U.S. population. Sure, it’s another industry. But for those in insurance who believe military experience can provide transferrable skills and potentially companywide benefits, there is a proper position for attack. UPS’s many-pronged approach to creating the right environment includes, for example, the opportunity for managers to take part in Boss Lifts, a program of the Employer Support of the Guard and Reserve (ESGR). It allows those who have never served to visit military bases for a day. The UPS program includes outreach to key veterans groups with direct connections to the Departments of Defense, Labor, and Veterans Affairs, in addition to veterans service organizations. And it goes beyond employment to include engagement, recognition and reputation. Engagement includes a host of opportunities for employees to get involved with military and veterans activities through the Neighbor-to-Neighbor (N2N) program. Employment recognition means increasing acknowledgement of those who are serving or have served. Reputation is about presenting the company as one that values the training, skills and life experiences of those who serve. Other UPS programs provide managerial job shadowing, opportunities for non-veteran volunteers to build wheelchair ramps for wounded veterans, partnerships that supply professional-level tools for veterans becoming mechanics, and affinity groups for members of the military. Despite the positive progress and the promise of engaged, well-trained and disciplined employees, those who work with veterans say they still hear the murmurs and concerns of potential danger. PTSD and traumatic brain injury are very real. Eversole’s father became a quadriplegic after completing his military service. And like anyone who was fully able before, he needed an adjustment period to get used to the new normal. Veterans—disabled or not—may simply need the same. For his part, Doran finds his status as a disabled veteran a bit “weird,” especially since he’s very active, playing sports five or six days a week. According to the Department of Veterans Affairs, Doran is considered “30%” disabled. While in the military, he had surgery on a shoulder (accounting for 20% of the categorization) and on a knee (the remaining 10%). It’s true that for veterans—as with anyone else—not all injuries can easily be seen. If businesses want to be successful in recruiting service members or spouses, they have to help underscore not only the types of careers available, but also the long-term opportunities in their business and their industry. And not all veterans—despite media reports, misconceptions and discomfort with the unknown—are the same.